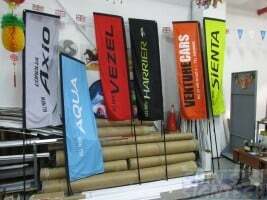 How different types of Teardrop banner, Feather flag and Rectangle flying banner fly when wind blow ! Which types of outdoor banners attract you most ? 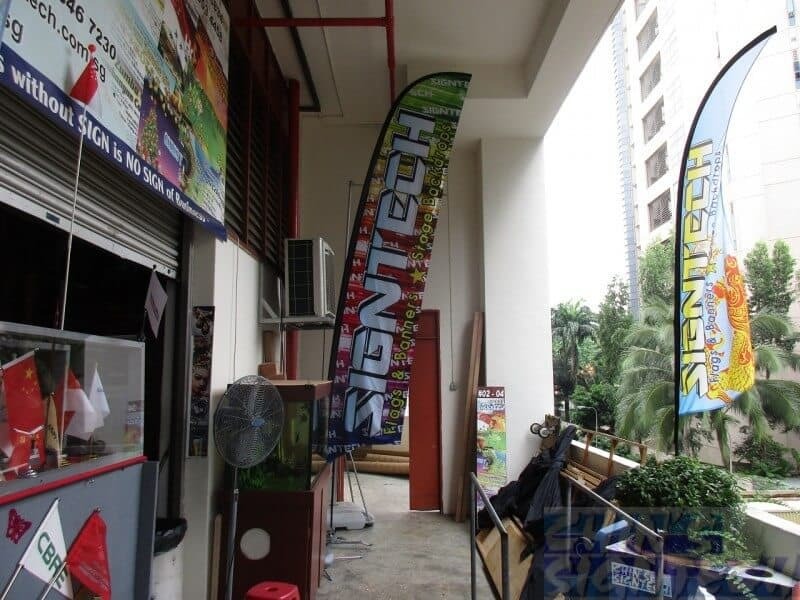 I wonder why so many people do teardrop shape, these teardrop banners don’t fly and wave at all. They just rotate with wind and turn around, look like a dead fish, see liao jin sian. Unlike Rectangle Block, S shape and Dragon Feather Flying flags. They really fly and wave with the wind, especially when the flag is done single sided, more light weighted. Overall the Dragon Feather Flying banners is the best ! The Dragon fins will move when small breeze blow, with this kind flying effect, passerby will attract to it. 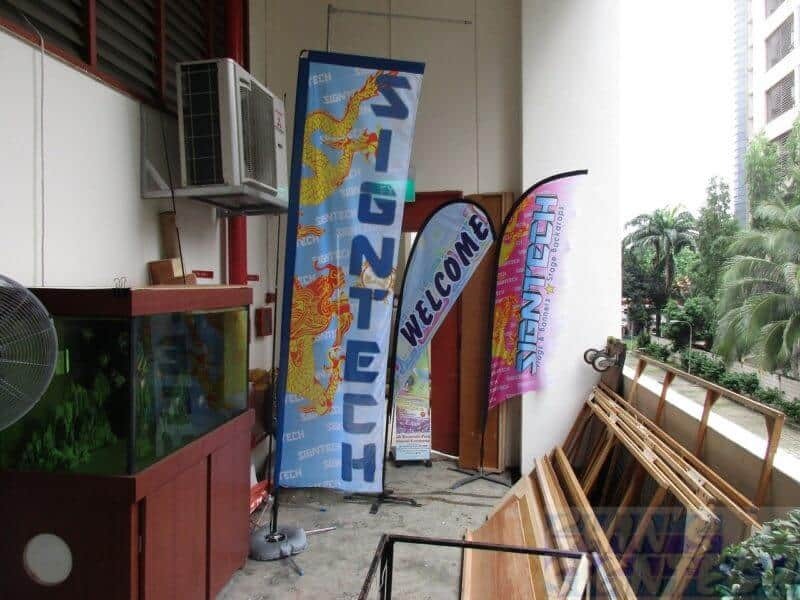 This flying banner come in the shape of teardrop or water droplets. 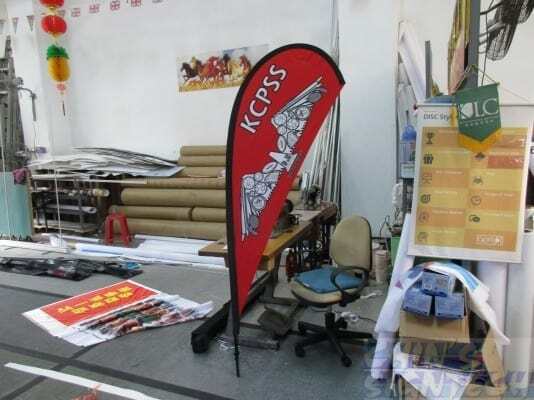 Texts on the banner must placed 30 degree slanting upward, graphics on the banner are limited due to the shape of the banner. The behavior for this flying banner is rotate Left or right, 360 degree only, depend on wind direction. This flying banner come in the shape of feather or knife. Texts on the banner are placed 90 degree vertical upward, graphics on the banner are good enough to be placed on the banner. 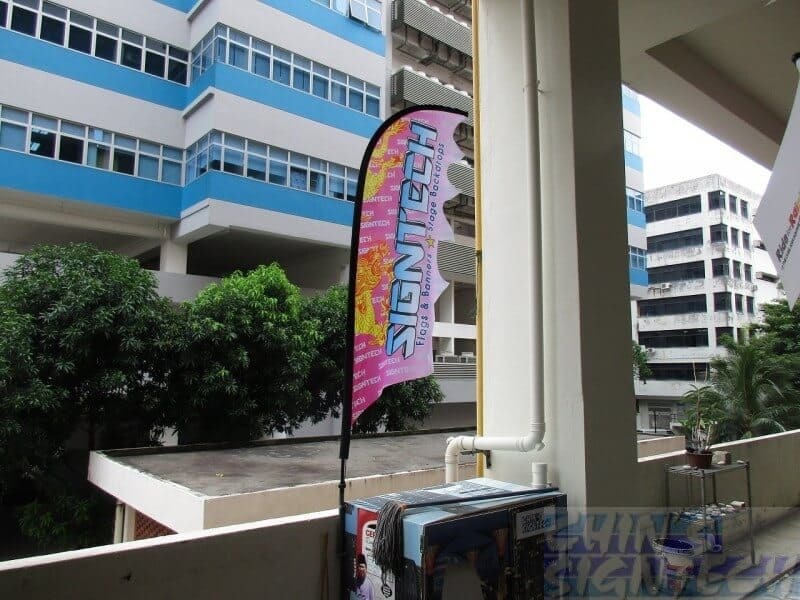 The behavior for this flying banner is rotate Left or right, 360 degree and the bottom part will flip when wind blow. This flying banner come in the shape of Rectangle. Texts on the banner are placed 90 degree vertical upward, graphics on the banner are huge enough to be placed on the banner. The behavior for this flying banner is rotate Left or right, 360 degree and the bottom part will flip when wind blow. Quite similar to Feather Flag, except the top portion of the flag is flat. This flying banner come in the S shape. Texts on the banner are placed 90 degree vertical upward, graphics on the banner are narrow to be placed on the banner. The behavior for this flying banner is rotate Left or right, 360 degree and the bottom part will flip like a leave (open and close) when wind blow. Only can do single sided printing due to it shape, rather complicated to do sewing. 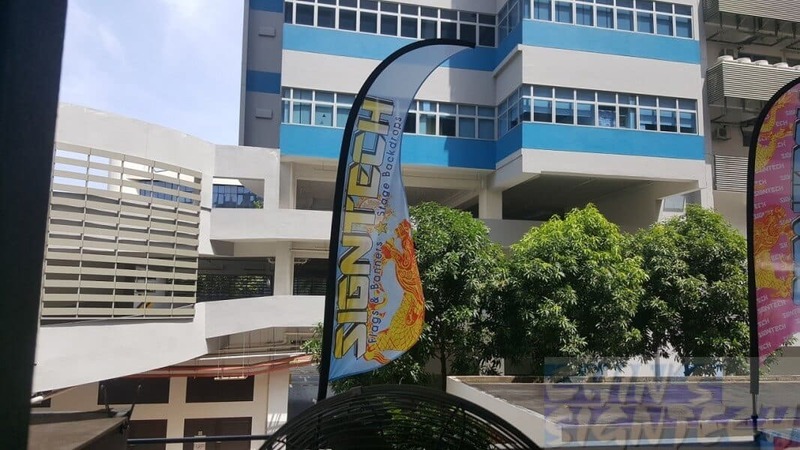 This flying banner is similar to feather flag shape, except it got dragon fins at it side. Texts on the banner are placed 90 degree vertical upward, graphics on the banner are good enough to be placed on the banner. The behavior for this flying banner is rotate Left or right, 360 degree and the side of the Dragon fins will wave and flip when wind blow. 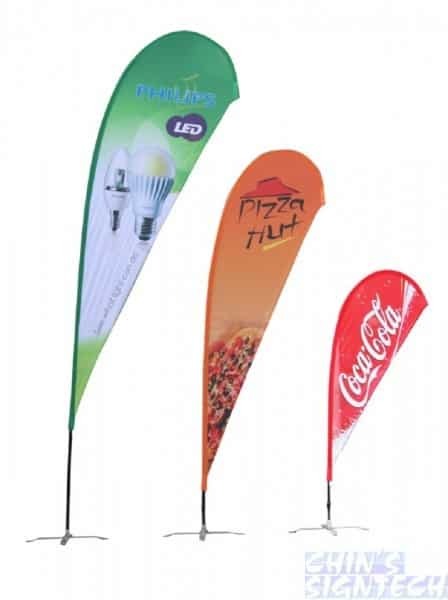 If Teardrop, Rectangle and Feather flying banners with single sided printing can do colour sleeves to match the colour of the flag. You no longer need to see boring Black sleeves. 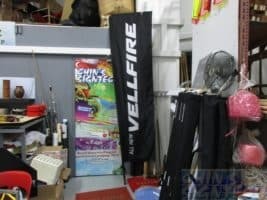 Rectangle Block Flags for advertising installed on fence without base. 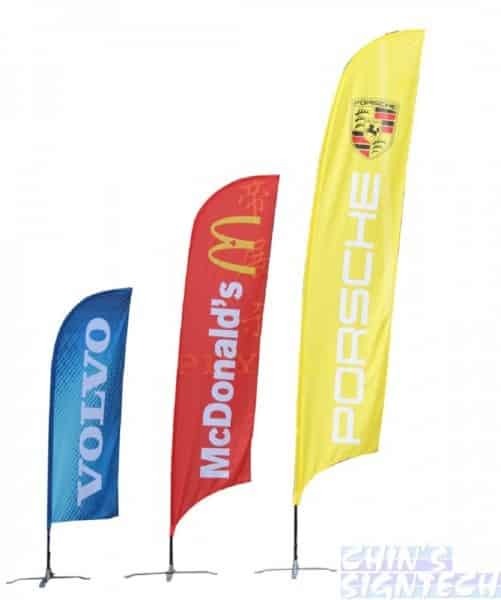 Did around 7 Rectangle Block Flags with double sided printing for this car sale company. 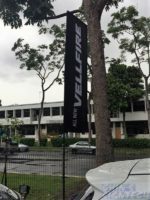 This company jin fierce, they installed these flying banners with cable ties at their fence with medium flag size 74X264cm on 4meter long fiber glass pole for advertising purpose.